The premiere of the first episode of Game Of Thrones season 8 proved that this season was worth the dreading and long, long wait of two years. While, on one hand, we cried joyful tears from the overwhelming and emotional reunions of our favourite characters, the shocking cold-blooded death of an ally reminded us of the impending arrival of the enemy, on the other. The terrifying death of Ned Umber (Harry Grasby) was another nail in the coffin of the living, as it points to the arrival of Night King in Winterfell. Game of Thrones 8 Premiere: Internet is Raving About The Three-Eyed Raven, Bran Stark Trends on Twitter. Ned Umber is the 10-ear-old King who became the Lord of House Umber after his family died fighting Jon Snow in the Battle of the Bastards. House Umber is a settlement based at the Last Hearth. The young Lord pledged his loyalty to Jon, after his predecessors betrayed the Starks by fighting for the Boltons in the seventh season. At the beginning of the episode, Lord Ned obliged Sansa Stark’s command and headed back to the Last Hearth to bring more horses ahead of the battle against the Dead Army. However, at the end of the episode, Tormund (Kristofer Hivju) and Beric Dondarrion (Richard Dormer) locate him stabbed to a wall surrounded by sawn-off limbs. Tormund, Beric and other survivors reach the Last Hearth after the destruction of the Wall. As the men discuss their next move, Lord Ned’s eyes pop open to highlight the fiery blue eyelids. The kid soon tries to attack the men, but Beric lights him on fire with his sword. Game of Thrones 8 Episode 1 Review: From Cheery Reunions to Bronn’s Foursome to the Night King’s Evil Message, a Recap of What Happened in the Premiere Episode of Final Season. 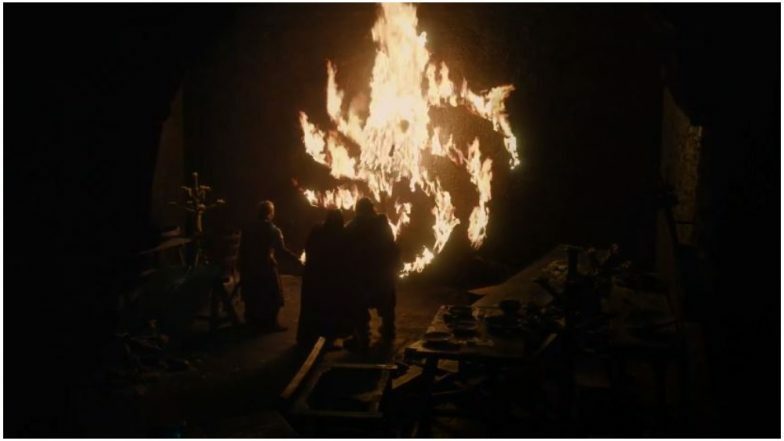 Interestingly, the limbs formed the shape of a spiral, which is the symbol of the Night King. The symbol has been previously used in the series, including the opening scene of the pilot episode. A similar spiral was later seen by Jon Snow in season three and also in the pattern carved into the walls of the caves in Dragonstone. The true meaning of the spiral is unknown but it is obvious that it is sacred to the White Walkers. If we go back into the series, the first known use of the spiral was made by the Children of The Forest. The Three-Eyed Raven had shown Bran the creation of the Night King in season six, which had a similar spiral pattern connected to it. The First Man (Night King) was impaled to a weirwood tree by the Children at the centre of the spiral pattern, where they stab him with a dragonglass dagger, thus turning him into the first White Walker. Hence, it is safe to assume that the spiral is a White Walker signature. However, this also implies that the Army of Dead is nearer than before and the death of Ned Umber is just the beginning.